Some strange activity is detected in the North so grab your guns, rockets and grenades and secure the territory. About face! MARCH! 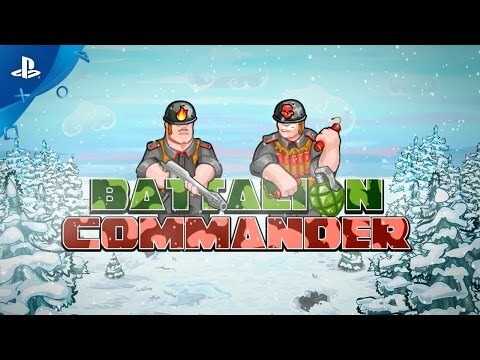 Battalion Commander is a fun military arcade game. Its main difference from the other similar games is that you can play not with only one character, but with a whole squad. And of course, multiple achievements and upgrades make it even more interesting. To defend your Motherland, you have to break through the bullets and bombs knee-deep in snow, confronted with even tougher and more desperate resistance of the enemy. You have to avoid ambushes and hidden flame throwers, hiding from the eyes of enemy snipers and undermine the tanks blocking your path. But don’t be afraid, you are not alone - like any commander, you have your subordinates! Snipers and flamethrower operators, grenade throwers and common soldiers will go with you into battle shoulder to shoulder. Somebody will be by your side from the start, some others have to be rescued from enemy captivity. But that’s why you need brothers in arms, because together you are the force! Between raids to the enemy you can relax in the Tactics Room, where you can spend the trophy savings on equipment for yourself and your people: treat your soldiers with new rifles and yourself with a six barreled machine gun. Here you will receive new ranks for exploits on the battlefield, giving you access to even more destructive weapons and improved equipment. In addition, in Tactics Room you will be given the mission task for the next raid, the implementation of which will be richly rewarded. Besides the experience and money, you’ll have a chance to get new opportunities to radically change the balance of the battle: for example, get a jeep at the beginning of a fight, or the ability to activate the energy shield. But don’t think you can easily obtain it, since each mission is a real challenge even for a skilled warrior. Are you sure you can win against 10 enemies armed to the teeth hand to hand without raising the alarm or hold for 3 minutes without the support of loyal squad? If you are up to the task - great rewards awaits you. Heavy attacks on the occupied territory. Cohesive enemy defense line, represented by more than 16 types of army standing between you and the powerful and dangerous "Boss". 48 missions testing your combat skills. Numerous upgrades, weapons and skills, which let you choose your own unique battle tactics... All this will draw you in deep for hours of battle. But if you want more adventure and experiments with all the collected arsenal after the victory, then start Endless mode where you have the opportunity to compete in endurance with other players. With Endless mode, you will want to come back to the game again and again. Make your name appear in the first place in the records list!